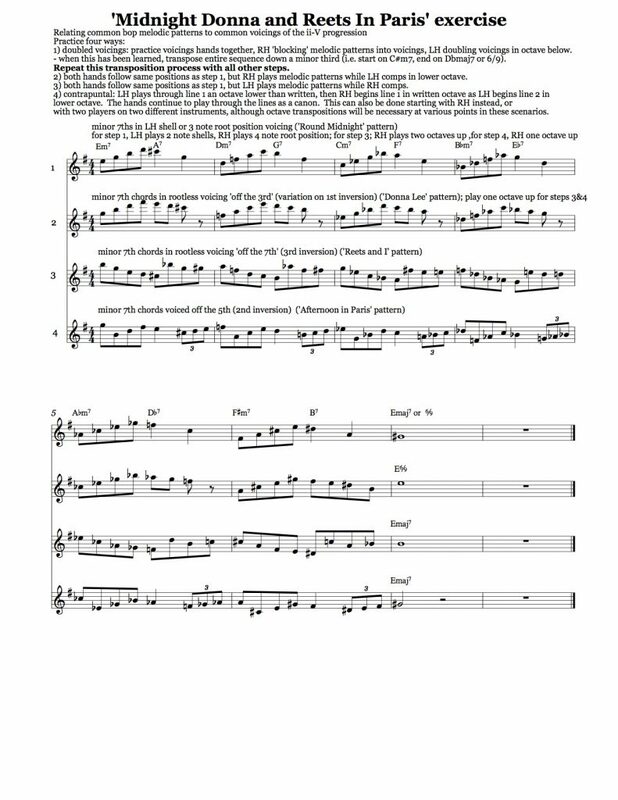 Finally, you can move on to reading from the exercise sheet, playing the melodic pattern in the RH while playing the LH voicings from memory. This process can be repeated for the other staves: – practice the ii-V-I voicing that starts with the ii chord voiced ‘off the 3rd’ as shown in this post before moving on to the pattern on staff two -practice the ii-V-I voicing that starts with the ii chord voiced ‘off the 7th’ as shown in this post before moving on to the pattern on staff three -practice the ii-V-I that starts with the ii chord voiced ‘off the 5th’ (i.e. 2nd inversion of the minor 7th chord) for staff 4. Staff 2 uses a lick from the third to last bar of ‘Donna Lee’ (an example of a ‘convex’ one-bar ii-V pattern), which I see as based ii-V with the ii chord voiced ‘off the 3rd’ (what Phil Degreg calls the ‘B voicing’.) The range of the L.H. voicings for this pattern should be adjusted to avoid the voicings going too high (above C5) or too low (below C3.) Staff three shows a pattern Barry Harris calls the ‘turnaround lick’ which also appears in the Benny Harris tune ‘Reets and I’, played by Bud Powell on ‘The Amazing Bud Powell Volume 2.’, and (in a more diatonic form) in the bridge of Jimmy Giuffre’s ‘Four Brothers’. Staff four shows pattern adapted from ‘Afternoon in Paris’. Each lick is transposed down by whole steps through six keys. 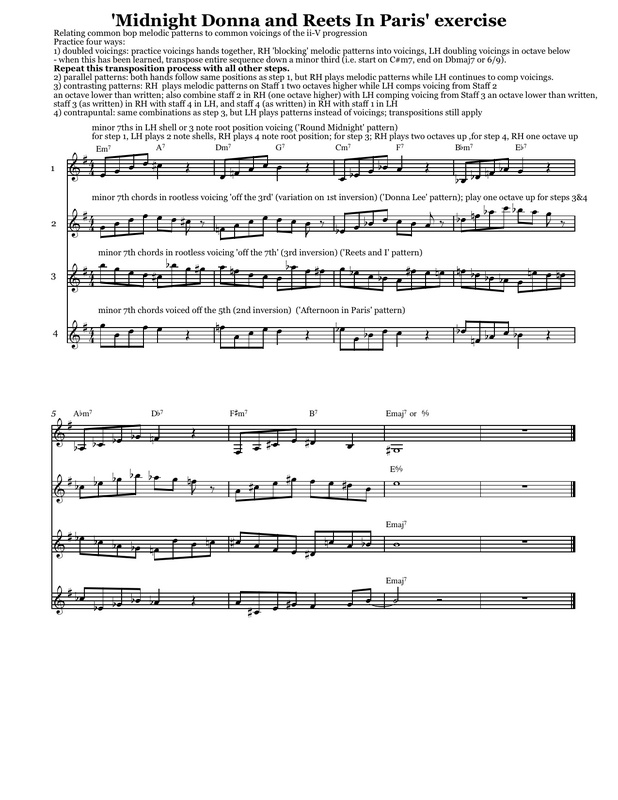 The title of the exercise, ‘Midnight Donna and Reets in Paris’, is a way to remember the order of the licks in the exercises, titled by their sources. There are two other ways to practice this exercise: with the RH playing the voicing while the LH plays the melodic pattern, and a contrapuntal approach, in which the exercise works as a canon: the LH starts alone on Staff 1, then the RH plays Staff 1 an octave up while the LH goes on to staff two, and so on. The contrapuntal version can also be played by any combination of instruments in pairs: once one player or group has finished bar 8 of the top staff, a second player or group can begin the exercise when the first player or group begins the second staff. Below the exercise are some thoughts on how many of the same player-composers in the bop tradition who were able to find great variety in melodic patterns based on chord voicings also showed an interest in anagrams and wordplay, particularly in their choices of tune titles. In the 2010 thriller movie ‘Shutter Island’, Leonardo DiCaprio plays Edward Daniels, a U.S. Marshal who is plagued by nightmares about an arsonist named Andrew Laeddis, Later in the movie, it is revealed that the names ‘Edward Daniels‘ and ‘Andrew Leaddis‘ are anagrams of each other, created by a mysterious mastermind. In other words, the two proper name/surname pairs share the same group of letters, and one was created by rearranging the letters of the other. (To find out which name came first, watch the movie, or in a pinch, read the Wikipedia entry.) Anagrams were a common interest among at least three great jazz piano masterminds: Thelonious Monk, Horace Silver and Bill Evans. According to Robin D.G. Kelley’s biography ‘Thelonious Monk: The Life And Times Of An American Original’, the title of the tune ‘Eronel’, usually attributed to Monk, is a reverse spelling of ‘Lenore’, the one-time girlfriend of one of the tune’s principal authors, the pianist Sadik Hakim. (By Kelley’s account, Hakim wrote the melody with Idrees Sulieman and Monk later added some characteristic touches.) Kelley also mentions Monk had a black onyx ring inscribed with the word ‘MONK’, which he liked to point out could be read as ‘KNOW’ when viewed upside down. Horace Silver titled one of his compositions, ‘Ecaroh’, with a reverse spelling of his name, and also used the same word to name his publishing company. Bill Evans named two modal tunes with anagrams of friends’ names: ‘Re: Person I Knew’ (Orrin Keepnews) and ‘N.Y.C.’s No Lark’ (an elegy for Sonny Clark). Sonny Rollins encoded the word ‘Nigeria’ by spelling it backwards in the title of his composition Airegin, and Barry Harris created an African-sounding word by spelling Art Tatum’s name backwards in the title of ‘Mutattra’ (from Listen To Barry Harris.) Wordplay also continues to be a common form of humor among rank-and-file working jazz musicians (sometimes called ‘club date musicians’); it is not uncommon for ‘In A Sentimental Mood‘ to be referred to as ‘In A Semi-Mental Mood’. Hi Reggie – Thanks for the question. My only point about Afternoon in Paris and Four Brothers is that in the first eight measures of both tunes, one sees two different arpeggiations of the same chord. In Afternoon in Paris, the first bar along with its pickup implies 4th inversion of Cmaj7, while the turnaround pattern in bar 7 (not included in the 5th edition Real Book that I first learned it from, but present in every recording I’ve heard) begins with a root position Cmaj7 arpeggio. (Incidentally, in the changes you list, the ‘D7’ in bar 8 should be a minor 7th chord, followed by a G7.) In Four Brothers, the melody in bar 2 implies a 3-5-7-9 voicing of the ii7 chord, while the melody in bar 5 implies a root position voicing of the same chord. Again, thanks for the opportunity to clarify this. Above are the changes to Four brothers then below Afternoon in Paris. Where are the variant spelling of the ‘same changes over four bars ‘ with different names? As I dont see it anywhere.